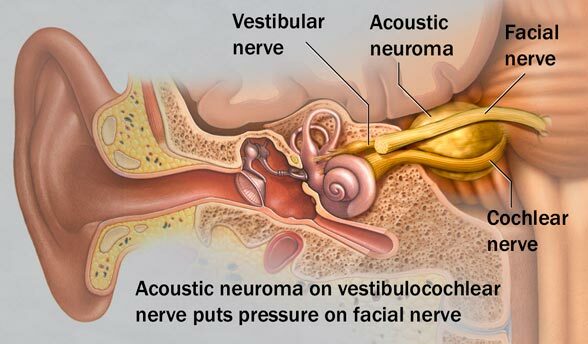 An acoustic neuroma is a skull based nerve sheath tumor that constitutes about 6% of all primary intracranial tumors. The are usually benign and slow growing tumor which arise primarily from the vestibular portion of the VIII cranial nerve and lie in the cerebellopontine angle - a wedge shaped area bounded by the petrous bone, the pons and the cerebellum. 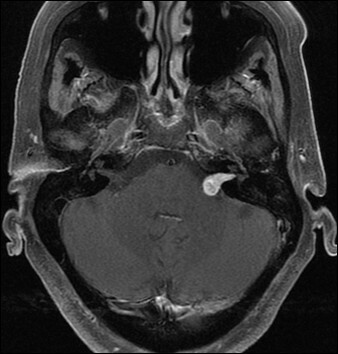 In general, all acoustic tumors with an intracranial diameter of up to approximately 4 cm qualify for Gamma Knife radiosurgery. Over the years, larger tumors occasionally have been treated successfully with this technique. The short-term and long-term risks of Gamma Knife Radiosurgery are very low. The goal of the treatment is to kill or inactivate the tumor cells so they no longer duplicate. Since acoustic neuroma is a very benign type of tumor, it need not be completely destroyed. Instead, the aim is to stop further growth. An acoustic tumor that does not grow will not jeopardize the patient's health in the future. Shrinkage actually is found in the vast majority of tumors when they are followed long enough following Gamma Knife Radiosurgery . This is an 18-ton machine with 201 permanently mounted cobalt-60 sources arranged spherically around the patient's head. These sources emit gamma radiation, which is similar to diagnostic X-ray but with higher energy. These beams are precisely shaped through two consecutive sets of tungsten channels (collimators). They all focus on one point. Here, the radiation is very powerful. However, each individual beam on its way through the skull is weak and will not cause any detectable biological effects. The gamma radiation destroys molecules in the tumor cells so they can no longer reproduce and eventually will die. The Gamma Knife is precise down to half a millimeter or even less (about 1/50 of an inch). Thus, a high dose of radiation can be delivered to targets with little harm to important sensitive structures just millimeters away or even adjacent to the surface. Dr.Sanjay Mongia , Gamma Knife Clinic . EMAIL : gamma@gammaknifeonline.in Ph: 9821313033 . All rights reserved.